I-405 Express Toll Lanes Part 1: What is the problem? Big changes are coming for I-405 drivers later this year. We’re building express toll lanes on southbound and northbound I-405 between Bellevue and Lynnwood to help ease traffic on one of the state’s most congested corridors. One of the biggest changes coming this fall is a proposed change in the HOV requirements from two or more people to three or more people during peak commute hours, part of the toll rate and exemption proposal by the Washington State Transportation Commission. We’ve heard a variety of reactions from folks about this proposal, and decided to tackle some of them in a two-part blog series. In this first post, we will discuss the problem we’re facing through a series of common questions we’ve received. In the second part, we’ll talk about how express toll lanes are part of the solution for I-405. To get to the solution, we have to start at the beginning. Return with me, won’t you, to November 1992. Aladdin opened at the box office, in Nashville, the great Miley Cyrus was born, and in Olympia, WSDOT adopted its Statewide Freeway HOV Policy. It was a magical time. The main goal of HOV lanes was (and still is) to maximize the movement of people rather than vehicles, whether that’s in a carpool, vanpool or bus. The target is to keep traffic moving consistently at a minimum speed of 45 mph to provide a reliable trip. By reducing the number of single-occupant vehicles on the roadway, HOV lanes also help improve traffic in the regular lanes. For example, when 15 people opt to get out of their cars to ride the bus or carpool with a co-worker, it removes up to 15 cars from the general purpose lanes. Animation illustrating how HOV lanes work. In 1994, the HOV Monitoring and Evaluation Technical Report showed that the majority of respondents in a public opinion survey supported HOV lanes and overwhelming supported that all HOV lanes should be open to vehicles with two or more people. What’s happening with HOV lanes on I-405 now? Congested HOV lane on I-405. Fast-forward 23 years. If you drive I-405, you’ve likely experienced that the HOV lanes are often as congested as the regular lanes during peak periods. That’s because there is too much demand for the lanes. Last year, WSDOT completed the I-405/SR 167 Funding and Phasing Report which found that the existing carpool lane north of SR 522, the one lane section of the future express toll lanes project, is at capacity during peak periods. It also found that there are 200 or more days a year when speeds are below 45 mph in the HOV lane on southbound I-405, south of SR 527. What is causing the increased demand? There’s a clear connection between the break down in the I-405 HOV lanes and population growth on the eastside. U.S. Census data shows that over the last 10 years, Seattle’s population grew seven percent, while the population on the Eastside, from roughly the Snohomish County line to Newcastle and everything east of Lake Washington to the crest of the Cascades, increased 15 percent. Washington’s residential and employment populations are only projected to increase. In the years ahead, the population of the city of Portland will be added to our region. We have a tremendous challenge to accommodate this massive growth. Shouldn’t growth mean building more regular lanes? That’s a common perception, but over the long term, it’s been shown time and time again that new lanes eventually become congested and simply add to the problem. We also must keep in mind that continually adding lanes our highways could also have impacts to local streets. We know from experience here and across the nation that we cannot simply build our way out of congestion, and we know that we need to get creative to manage the growing demand on our roadways. One of the best ways to do that is to learn from what’s working in other states facing similar challenges. What is WSDOT doing to create solutions for increasing demand on I-405? Over the last decade, WSDOT has worked with cities, counties, federal agencies, transit agencies and community groups to develop consensus on a long-term vision for the multimodal redevelopment of this highway. We adopted a multi-modal approach to ease congestion on I-405 that included, adding more lanes, improvements to local roads, increasing transit service, adding park and ride spaces and vanpools, and the possibility for an express toll lane system. After three published studies on I-405 express toll lanes, one of which was review by a panel of nation experts, WSDOT is implementing express toll lanes on I-405. Express toll lanes are a proven strategy for congestion relief that have been implemented, studied and expanded across the country. In the next post, we’ll discuss how express toll lanes will work in Washington as part of the solution for I-405. 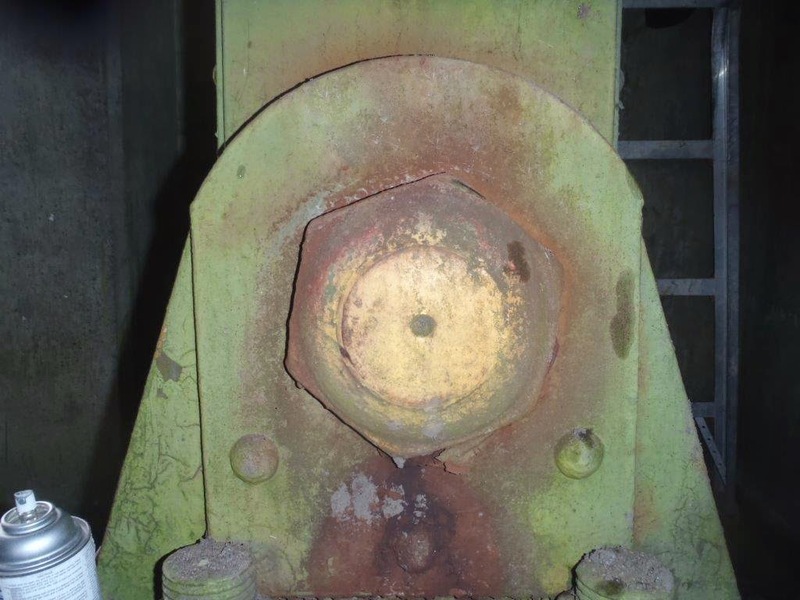 Area of the bridge before the rust was removed. Crews have completed the painstaking process of hand-removing truckloads of dirt, debris and other gunk from the State Route 305 Agate Pass Bridge. Crews removed roughly 9 tons of material, which is more than the average size of an African elephant. After removing debris, crews most recently have been flushing the bridge with low-pressure water to complete the cleaning process. Our workers also are turning their attention to removing rust. They use specialized air-powered tools that grind rust away. To help protect the environment, the rust is scooped up by a connected vacuum system. After the rust is removed, they apply a zinc coating that protects the underlying steel from future rust. 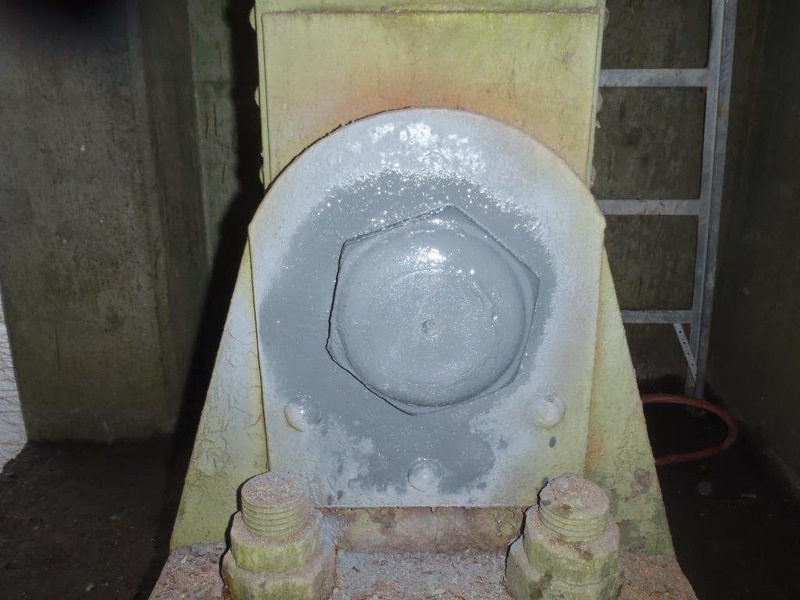 Crews continue to find what they expected on a bridge of this age – missing or rusted rivet heads, rusty bridge pins, chipped and broken sidewalk sections, etc. We will know more about the overall condition of the bridge after a complete inspection is done next week by our bridge preservation engineers. That’s where highly-trained experts will conduct a meticulous inspection of this key link between Bainbridge Island and the Kitsap Peninsula. We offer our immense gratitude to drivers who continue to avoid the bridge during work hours. It makes a big difference when people consolidate trips, carpool, and cancel discretionary trips. a zinc-based product to protect the underlying steel. On Sunday, Feb. 22, the Chilly Hilly bike ride is scheduled to take place between 8 a.m. and 3 p.m. Although the bike route does not cross the Agate Pass Bridge, we expect higher traffic volumes on SR 305 as participants from the Kitsap Peninsula drive to the starting point in Bainbridge Island. We would like to ask those Chilly Hilly participants to please add extra travel time to cross the bridge both on their way to the event, and on their journey back home. Washington State Ferries has noted about a 5 percent decrease in vehicles on their mid-day Bainbridge Island runs, and a 3 percent and 4.5 percent increase in their daytime Bremerton and Kingston runs, respectively. We would like to thank ferry users who have changed ferry routes to avoid crossing the bridge, and encourage them to continue doing so since Ferries still has excess capacity on their mid-day Bremerton and Kingston runs. If all goes according to plan, the work will wrap up on Saturday, Feb. 28. Until that time, we continue to ask drivers to plan ahead and expect delays during the following times. Science is about observing and experimenting. It’s about exploring unanswered questions, solving problems through curiosity, learning as you go and always trying again. That’s the spirit behind the fifth annual Google Science Fair, kicking off today. Together with LEGO Education, National Geographic, Scientific American and Virgin Galactic, we’re calling on all young researchers, explorers, builders, technologists and inventors to try something ambitious. Something imaginative, or maybe even unimaginable. Something that might just change the world around us. 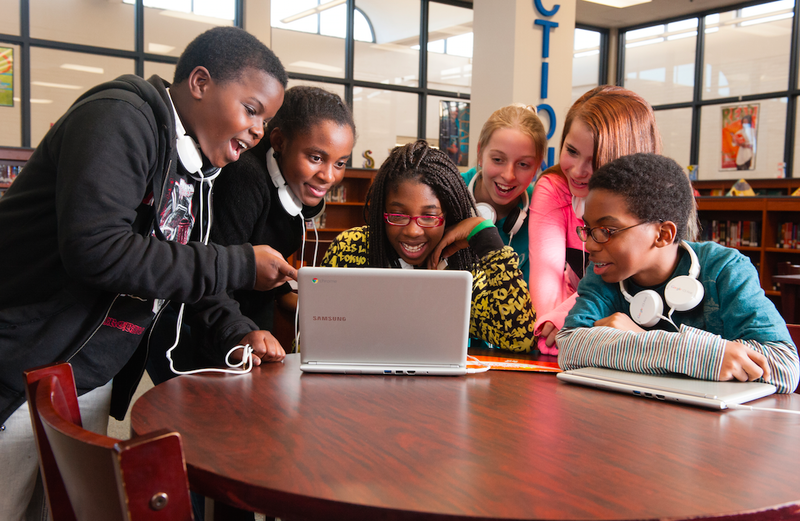 From now through May 18, students around the world ages 13-18 can submit projects online across all scientific fields, from biology to computer science to anthropology and everything in between. Prizes include $100,000 in scholarships and classroom grants from Scientific American and Google, a National Geographic Expedition to the Galapagos, an opportunity to visit LEGO designers at their Denmark headquarters, and the chance to tour Virgin Galactic’s new spaceship at their Mojave Air and Spaceport. This year we’re also introducing an award to recognize an Inspiring Educator, as well as a Community Impact Award honoring a project that addresses an environmental or health challenge. It’s only through trying something that we can get somewhere. Flashlights required batteries, then Ann Makosinski tried the heat of her hand. His grandfather would wander out of bed at night, until Kenneth Shinozuka tried a wearable sensor. The power supply was constantly unstable in her Indian village, so Harine Ravichandran tried to build a different kind of regulator. Previous Science Fair winners have blown us away with their ideas. Now it’s your turn. Big ideas that have the potential to make a big impact often start from something small. Something that makes you curious. Something you love, you’re good at, and want to try. So, what will you try? 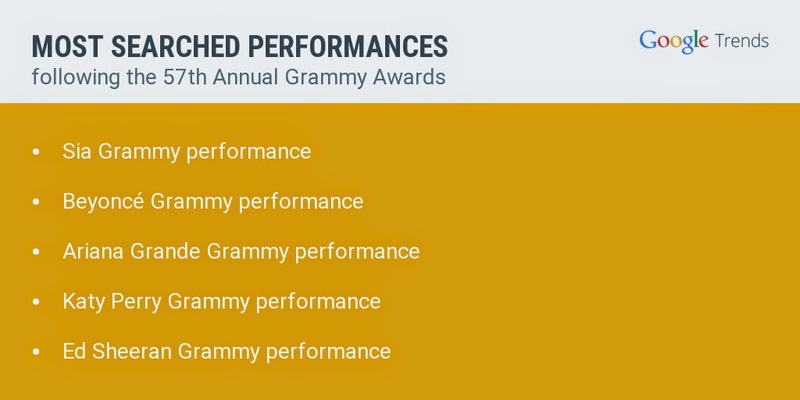 Around The Grammy’s last week, two artists were at the front of the search pack: Beck, who took home the Album of the Year award, and Kanye West. Kanye almost pulled a Kanye (of 2009 VMA’s fame) when he appeared on the verge of interrupting Beck’s acceptance speech; West was upset that Beck won the award over Beyonce, who (according to West) had the best album of all time. 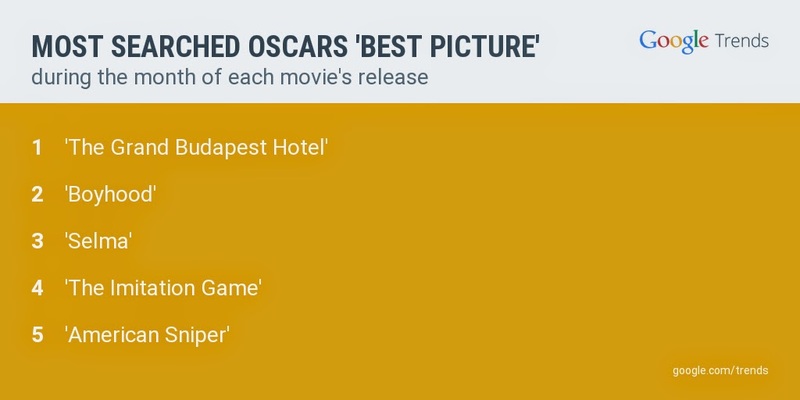 Other top artists in search include Sia—along with Kristen Wiig, who appeared in Sia’s Grammy performance, although Sia’s face did not—and Annie Lennox, who’s still got it. Finally, searchers were struck by a sober moment during the ceremony: after domestic abuse survivor Brooke Axtell shared her personal story on stage, search interest in [domestic violence] spiked 93x. Shock followed shock for news hounds this week. First, a week after Brian Williams admitted that he had wrongly claimed to have been on a helicopter that was shot down in Iraq in 2003, he was suspended for six months by NBC’s Nightly News. Now he’s at an all-time high in search. Meanwhile, Jon Stewart announced he will leave The Daily Show after 16 years, devastating loyal fans everywhere and inspiring speculation over who will replace him. And finally, we said goodbye to two legends of journalism: Bob Simon, CBS News reporter and 60 Minutes correspondent for decades, and The New York Times’ media columnist David Carr are being mourned by colleagues and readers. 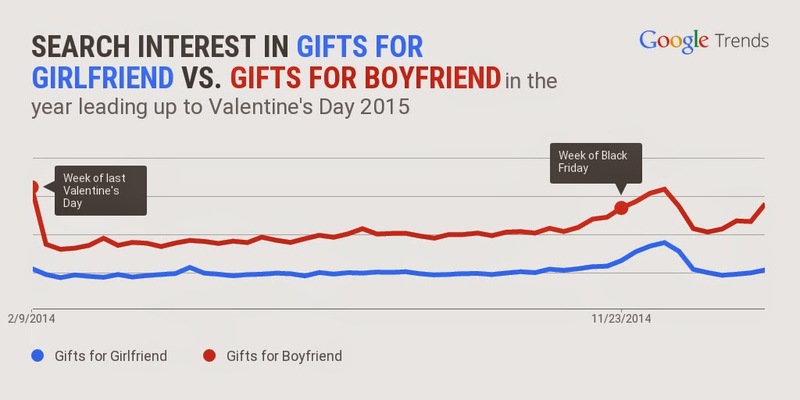 Valentine’s Day has people scrambling and searching for flowers and gift ideas. 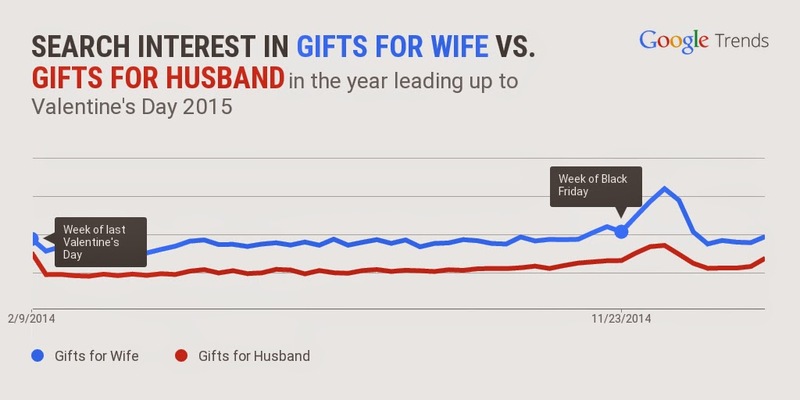 Interestingly, there are three times as many searches for [gifts for a boyfriend], than [gifts for a girlfriend], but when it comes to married couples things are reversed: there are more searches for [gifts for wife] than for [gifts for husband]. 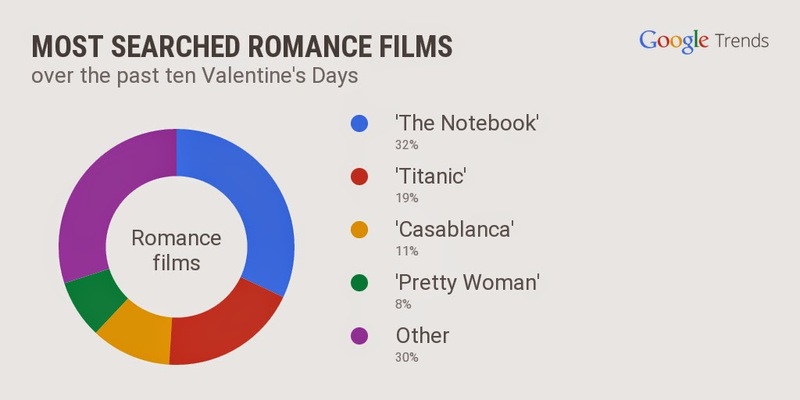 (We’ll just leave that there.) 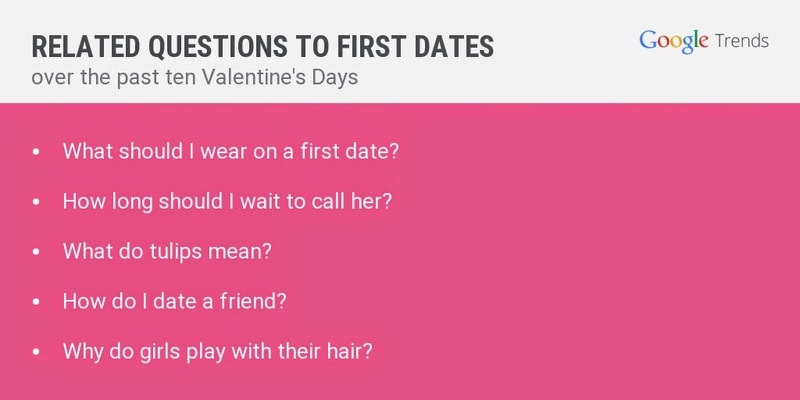 People turn to search for planning all kinds of Valentine’s Day activities, from “What should I wear on a first date?” to choosing a romantic movie. Go on, tell that special someone how you feel this weekend. The Google app can help—when your own words just aren’t good enough, say “Ok Google, show me a love quote.” Pro tip: give credit where credit is due. No one likes a plagiarist.